Created by Naveen Kumarasinghe early this month, the Ubuntu Touch concept phone shown below is named Primus and it represents an interesting piece of gear. First of all, we seem to be dealing with a combo between metal and glass, perhaps even a transparent phone. The designer of the device didn’t share any details, so we’ve got to speculate here. 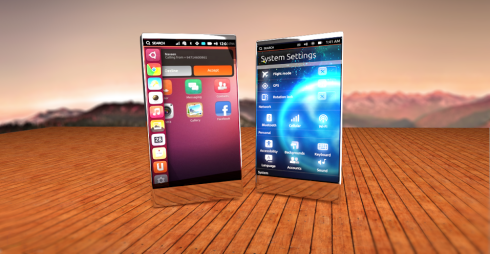 I’m pretty sure that the upper side of this Ubuntu Touch phone is made of metal and the lower side is transparent glass. The Primus also seems to be an edge to edge display device, which keeps up with the modern trends suggested by the LG G2 and the likes. This handset feels rather short and “fat”, perhaps with a diagonal closer to 4.3 inches rather than 5. It’s also a bit more squared than your average smartphone and closer to a Lumia format, if you want. From what I can see, the Ubuntu Touch Primus unit is very slim and has an intuitive way of accessing the main apps from a list on the left of the screen. From what I know this left edge allows you to access apps pinned to the launcher and if you swipe all the way across you can reveal the Home area, with apps, files and contacts. Multitasking is done by swiping the finger from the right edge to the left, switching to a previous app.